Prince Diabaté hails from a prominent, Malinké family from Guinea, West Africa. He learned his art from his father, Djéli Sori Diabaté. Breaking with tradition, his father also taught Prince’s mother, Hadja Djeli Sira Cissoko, to play kora. The young boy became an exceptionally early starter by accompanying his parents to their concerts throughout West Africa. Despite his father’s disapproval, he decided to make music his life. When he was eight years old, form Guinean President, Sekou Toure, came to his home town, Kindia, for a celebration in Independence Square. Braving the outraged soldiers and his own fear, the young musician grasped his kora, threw himself at the President s feet and played a special song for him. Greatly touched by his skill and audacity, Sekou Toure became his benefactor, enrolling him in the National Children’s Theater in Conakry. At 16 years of age, in Abidjan, Ivory Coast, he stumbled upon a videocassette of Jimi Hendrix, and entered the international kora competition. Taking first prize that day ‘Prince Diabaté, Prince of the Kora’. In 1986 he put the singer, Amara Sanoh, and the two started to perform together. In 1990 he won the “Discoveries” Award, sponsored by Radio France Internationale. After 12 successful years on the international festival circuit, touring Africa, Europe, Canada and the USA, the duo disbanded and Prince Diabaté settled in Los Angeles, USA. Prince Diabaté has released three CDs: Lamaranaa (Buda Music / Allegro) in 1993, New Life (Sunrise Records / Orchard) in 2001, which features guest artists Michael Brook and Hassan Hakmoun. His next album, Djerelon (Kora Company Collection) was recorded in Guinea, Conakry in 2006. It is arranged and produced by Kante Manfila, longtime collaborator of Salif Keita.The album won the People’s Choice Awards (Vox Populi) in the Independent Music Awards for 2007: World Music (Traditional) category. Lamarana and New Life are available as digital downloads with Virgin Islands and Djerelon is available through Itunes. 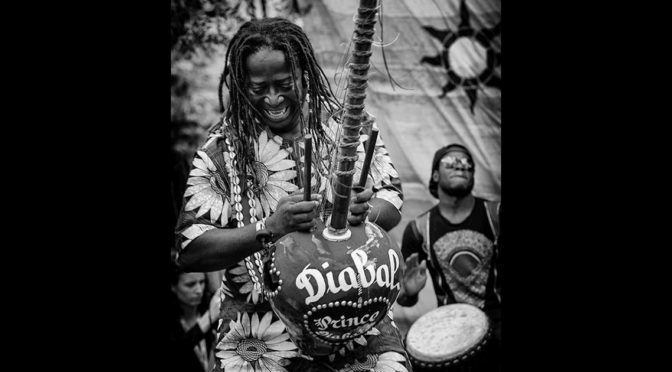 Considered to be one of the leading kora players of his generation, Prince Diabaté does not have a total mastery over his ancestral tradition, but a commitment to renew it through fresh ideas and exchanges with musicians from many cultures. His New York Symphony Orchestra, Adam del Monte (Flamenco) Hassan Hakmoun (Gnawa) and Grammy winners Michael Brook (guitarist-producer-composer) and Ozomatli (Hip-Hop fusion .) The musically adventurous griot has incorporated reggae, rap and blues into his work, and further developing his “Jimi Hendrix” technical, also punctuates his work by the occasional, funky use of the wah-wah pedal. Recently, he has adapted the music of the Wassolou to his repertoire, which he plays, self-taught and kora-style, on the kamelen n’goni. The result is entirely his own creation: a fresh, powerful brand of twenty-first century Manden music, which remains firmly rooted in traditional codes and references. In 2001, he recorded with Ozomatli on “Embrace The Chaos,” their Grammy-winning CD. In 2002, he was nominated for the LA Weekly Music Awards and the New Times Music Awards. He was also a finalist in the International Acoustic Music Awards for 2004; the Unisong Contest for 2005-2006; the International Songwriting Contest for 2004 & 2005; and took first prize in the 2005 and 2006 Pacific Songwriting Competition.His work has attracted grants from Arts International; Alliance for California Traditional Arts; Los Angeles County Arts Commission, Los Angeles Cultural Affairs Department and the Durfee Foundation. Prince Diabaté also maintains an active schedule as a lecturer on aspects of Mandinka music. His clients to date include colleges and universities in California, Washington State and New York. He is also sought after for film and television projects in Hollywood. These days Prince Diabaté divides his time between France, the USA and Guinea and is often on the move, performing with his group.At the end of 2013 the Prince Diabaté Academy of Music was officially launched in Guinea. This new academy, the first privately-funded establishment in Guinea, is the result of Prince Diabaté’s desire to create an international music school specializing in stringed instruments and traditional flute. Thanks to the encouragement of government ministers, construction is underway and the foundation stone was laid in December 2013.